By using this website at www.thedigitalconvert.com or otherwise submitting an order to our company doing business as The Digital Convert ("Company"), you agree to be bound by the following Terms and Conditions. These Terms govern your access to and use of the our website and service ("Service"). By accessing our website or purchasing our services, you agree to these Terms. We reserve the right to modify these Terms at any time and will post such changes here. By submitting any order with the Company you are accepting the current pricing as published on our website at the time of order. Our website is the only official source for current rates and pricing. The date of revision will be posted on this website for 30 days in the event of any pricing changes. There may be some items that are not listed on the website. If pricing for a particular item or service is unlisted, or for large complex orders, you may request an official quote in writing. Only an official quote on company letterhead - submitted physically or electronically by an authorized representative of the company - shall be considered binding. If we approve your request for a quote, there may be a fee associated with the preparation of such an official quote which may involve a significant amount of time organizing, examining and counting your materials. Any such fee will be reflected in your quote and be due immediately if you should decide not to use our services. In the absence of an official quote prior to processing, you agree to pay the Company's rates whether published on the website or, in the case of unlisted or unique items, the rates determined by the Company to be commensurate with the services provided. When requested, we may try to give some estimate, as a courtesy, at the time of order based only on the rates published on the website. 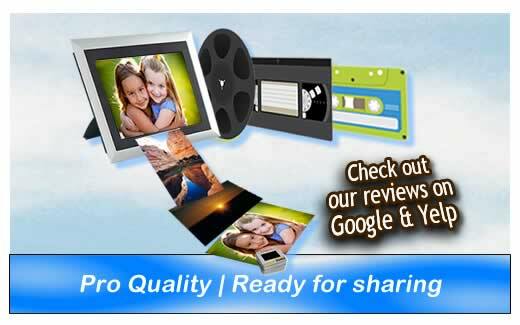 We may ask you roughly how long your videos are or approximately how many photos are being submitted for conversion. However, in no event shall any oral estimate be construed as an official, binding quote. There is little way for us to accurately estimate the quantity of photos or video footage before processing. If you provide a budget, we will attempt when feasible to call you when your order approaches your budget. However, in the absence of an official quote request, submitting an order is a binding agreement to pay for the transfer of all materials submitted. Payment is due upon completion of each order and may be charged to the customer's credit card on file. For large orders, we may also charge a deposit before processing begins. If the customer fails to pickup their items within 14 days, we may add a shipping charge and ship all materials back to the customer. Every order is carefully processed to our highest standards. If a customer is not satisfied with a service order, we will review the order and attempt to correct any potential issues to your satisfaction. However, service orders are not refundable. All media transfer orders are completed on-site unless indicated otherwise. If some non-standard submitted materials cannot be transferred on-site, we will ask if you would like us to fulfill via a 3rd party. In addition to our media transfer services, you may order print products or other gifts from partnered vendors via our client portal at http://gallery.thedigitalconvert.com . Any print orders fulfilled via our client portal are subject to the terms of our photo hosting service and can be viewed at http://bit.ly/1zWYHpA . We may provide estimated turnaround times at the time of your order for your convenience. These estimated times are not guaranteed. Only approved rush orders, with associated rush fees, will be provided a guaranteed turnaround date at the time of your order. If a rush order cannot be completed by the provided time, you are still responsible for whatever services have been completed by the time of pickup or shipment. Only the rush fee is refundable. By submitting an order, you grant permission to ship your materials back to the address on file and charge any associated costs to your card, including pickup or shipment insurance fees if applicable. For local orders, we will hold your items up to 14 days before preparing for shipment. We shall be under no obligation to hold your items beyond this time. It is your responsibility to provide us with an updated address as needed. At our own discretion, if you request your materials to be held longer, we will charge a storage fee of $15 per week. However, if you do not pickup as promised, we may ship your item at any point after the initial 14 days without further notification. You will be provided tracking information and you may discuss delivery arrangements with the courier. 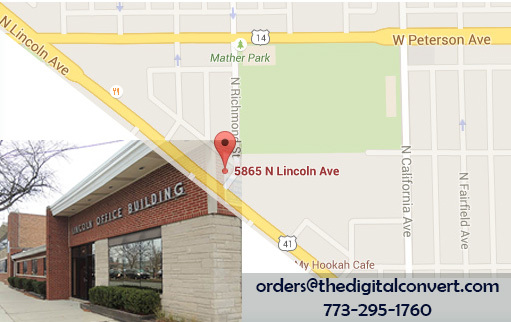 Further, any services purchased from The Digital Convert are pursuant to a shipment contract. This means risk of loss passes to us once your materials arrive at our offices and passes back to you upon transfer to the courier, either directly to their agent or when placed in a shipment dropbox. The Digital Convert is not responsible for any lost, late, misdirected or damaged mail. The shipping carrier to be used for any order is at the sole discretion of the Company. We recommend that file versions are ordered for any shipped items. This way, in the rare event of a potential loss during your return shipment, we will likely be able to recreate your media and redeliver. We may also optionally include parcel insurance to cover the reprinting of any lost photos from digital images that are still on file. Personal use agreement & warranty that submitted materials are free of copyright. By submitting an order to The Digital Convert, you represent that you have full ownership rights to all materials submitted and that no materials that you have submitted are in violation of any copyright laws. You also agree to indemnify and hold harmless The Digital Convert and its employees or agents from any third party claims which may arise from unauthorized use of any submitted materials in violation of any existing copyright agreement. Due to the volume our operations, we cannot fully check every item submitted nor could we know whether or not the rights for a particular photo had been previously purchased by an individual. If any of our employees become aware of a likely copyright violation, we reserve the right to refuse service as required by law. Any items under copyright protection are subject to the terms of the copyright holder. For example, if you had professional photos taken and the photographer charges $200 to make a print, you must obtain a signed waiver from the photographer to reproduce that image digitally or on print. If you purchased the rights to a professional image or a photographer is no longer in business, you accept full responsibility to determine exactly what rights are available to you and uphold the terms of those agreements. If you are to determine at a later point that an item was in fact under copyright protection, further reproduction or dissemination of that item is prohibited. If we are hosting your photos on our client portal, you must report it as soon as possible so we can remove those photos. When you purchase music at retail, you are purchasing a personal license only, subject to the terms of its publisher. Distributing such files, digitally or as compilation/mix CDs, is illegal. We do not accept mix CDs for our duplication service. You must own all rights to content submitted to the Company. The Digital Convert may, at its sole discretion, provide online photo hosting or backup services via a 3rd party hosting service to its clients to share their media digitally following conversion. This service is offered through our marketing department and is wholly separate from our digitization services. The availability of this hosting service, outside of prepaid subscriptions to such service, should not be seen as an obligation of The Digital Convert as a required part of any offered service, nor is it the right of any client. This program or any of its features may be modified or terminated at any time. Any print orders fulfilled via our client portal are subject to the terms of our photo hosting service and can be viewed at http://bit.ly/1zWYHpA . 1) You agree to have your photos hosted on the servers of 3rd party hosting service, and you alone accept all responsibility for their privacy when online. You may choose to keep your photos public but unlisted to enable friends to access your photos more easily. Or you may protect your gallery with a password. Regardless of which method you choose, you release The Digital Convert and its employees, agents and partners from all liability relating to the privacy of your photos. If there are specific photos or galleries you would prefer not to be online, or if you would like them organized differently, you must request their removal in writing. There may be a fee for such gallery management. If you have privacy concerns about your photos, be sure to only share with trusted friends and ask them only to share with responsible individuals as well. Your use of our service is at your own risk. 2) If you do not accept the terms of our hosting service, you may choose to delete your account at any time. This will also PERMANENTLY delete any photos from our system. 3) You agree to notify us promptly of the existence of any images that infringe on a 3rd party copyright so they can be removed. This can be done easily by commenting privately on the photo and choosing to send the comment to the photographer. 4) A condition of of its use is your active participation by sharing with a minimum number of invitees. There is no obligation purchase print products. 5) This service should never be used as a replacement for long-term backup of your images. It is meant primarily for sharing and printing. Your DVDs/USB are your official personal copies and should be copied to your home computer, as well as a 3rd location (ideally away from home), immediately upon their receipt at the completion of your digitization order. 6) Activated accounts will only remain active for a limited time depending on the order size. You may pay to extend any gallery you've been invited to. Once a gallery expires, all photos will be marked for PERMANENT DELETION. 7) You are responsible for sharing with trusted individuals if that is your desire. As such, any comments posted to pictures - offensive or otherwise - are your responsibility. We can remove the commenting feature if needed. There may be a fee for gallery management. 8) Content License - In order for The Digital Convert to provide its services to you and your invitees, as a condition of use, you hereby grant to The Digital Convert, solely for providing or improving the Service (e.g., customer support, technical support and/or vendor order fulfillment), the right to copy, display, modify, distribute, transmit, and make derivative works of your Content. Content Ownership - As a condition of use, you represent and warrant to The Digital Convert that you either own all gallery content or have written permission from the copyright owner to make such content available. 9) The Digital Convert does not guarantee the organization of photos displayed through this service to precisely match that of your digitization order. 10) Any product or service made available through this service is provided on an "AS IS" and "AS AVAILABLE" basis with no obligation to customize or modify. Any request for a customization of products or services beyond what is currently available or offered is subject to approval and associated fees. By submitting media to The Digital Convert, you understand and agree that our liability is limited in the following ways: The Digital Convert’s website and all information, content, materials, and services included on or made available through this site are provided on an “as is” and “as available” basis, unless otherwise specified in writing. We makes no representations or warranties of any kind, express or implied, about the operation of our website or the information, content, materials, or services included on it or made available to you through it. The Digital Convert disclaims all warranties, express or implied, including implied warranties of merchantability and fitness for a particular purpose. The Digital Convert will not be liable for any incidental, consequential, special or punitive damages, loss of future revenues or income, lost profits, loss of business reputation or opportunity relating to any breach or alleged breach of these Terms and Conditions. This limitation of liability will be effective regardless of whether such liability is based on breach of contract, tort, strict liability, or any other legal theory. By submitting media to The Digital Convert for any service, you agree that if any such media is lost or damaged by us, it will only be replaced with an equivalent blank media or the value of that blank media. So regardless of the content of any video tape or any personal sentimental value, we will only be liable for the replacement or cost of an equivalent blank physical media - a blank video tape. The handling of your media by us is otherwise without warranty or liability. At our sole discretion on return shipments, we may add parcel insurance to protect against loss by a shipping provider such as UPS or FedEx. As described above, all responsibility for shipments is with the courier. While personal value is unlikely to be covered by UPS, for example, such insurance may help offset the cost of recreating your physical materials from digital files in the event of loss. We do not guarantee the availability of your files on our systems beyond order completion, but we do generally store files for at least a month. In the event this clause applies, The Digital Convert is not liable for any loss, damage, delay, or non-performance of services to the full extent excused under applicable law. This clause applies if the loss, damage, delay, or non-performance is a result of Acts of God, or natural disaster or catastrophe; war, invasion, other hostilities (including acts of terrorism), rebellion, or other materially disruptive military or political event; embargo or labor dispute; power failures or other disruptions to services and utilities on which The Digital Convert relies; or any other unforeseen and external occurrence for which The Digital Convert is not responsible and could not predict which is required for the performance of its obligations. 2) AS IT RELATES TO OUR PHOTO HOSTING SERVICES, RESULTING FROM ANY VIOLATION OF OUR TERMS OR ANY ACTIVITY RELATED TO THE SERVICE (INCLUDING NEGLIGENT OR WRONGFUL CONDUCT) BY YOU OR BY ANY OTHER PERSON ACCESSING THE HOSTING SERVICE AS YOUR INVITEE, SUCH AS BY USING YOUR ACCOUNT OR SHARING YOUR PHOTOS. The state and federal courts of Illinois are the exclusive forum and venue to resolve any and all disputes arising out of or otherwise relating to these Terms. You consent to personal jurisdiction and venue by the state and federal courts of the State of Illinois. You and The Digital Convert both agree that any dispute resolution proceedings, whether judicial or arbitrated, will only be conducted on an individual basis, and not in a class nor any other consolidated or representative action. The Digital Convert may amend these Terms at any time, for any reason, and without notice, including the right to terminate the Service or any part of the Service. Any amendments or modifications made by The Digital Convert will be prospective only. These Terms constitute the entire agreement between you and The Digital Convert governing your use of all Services. In the case of inconsistencies between these Terms and any information included in other materials (for example, promotional materials, advertisements, oral discussion, phone or video recordings etc), these Terms will always control. You may also be subject to additional terms and conditions that may apply when you use our photo hosting services, with products fulfilled by outside vendors. The failure of The Digital Convert to exercise or enforce any Term will not constitute a waiver of such Term. If any Term is found by a court of competent jurisdiction as invalid, the parties nevertheless agree that the court should strive to give effect to the parties' intentions as reflected in the provision, and the other provisions of these Terms remain in full force and effect. Regardless of any statute or law to the contrary, any claim or cause of action arising out of or related to the Service or these Terms will be filed within one year after such claim or cause of action arose, or be forever barred.